In previous Posts, I wrote about the fact that from January 1919 to mid - 1920 Bolshevik Russia had no mail links to foreign countries - a very unusual and possibly unique situation for a European country to find itself in during the 20th century. This adds to the interest of mail from December 1918, when connections were still in place. 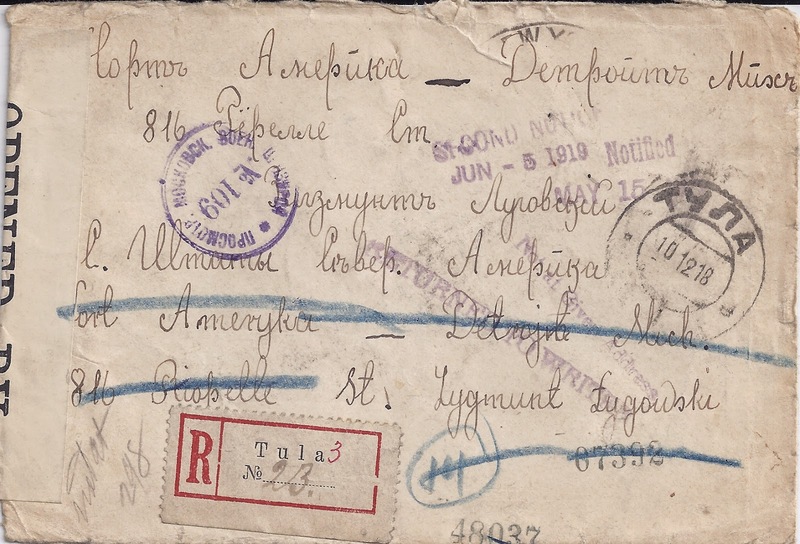 Here is a cover Registered at TULA - well to the East - on 10 December 1918 (Old Style). Franked to 40 kopecks on the back, it was routed to Moscow where a circular violet Censor cachet was applied (front of cover, top left). I don't know what route it then followed, but the British got hold of it and censored it, the Censor writing on the paper seal "From Enemy occupied territory". Since the Armistice was in place, this can only refer to Bolshevik Russia itself. 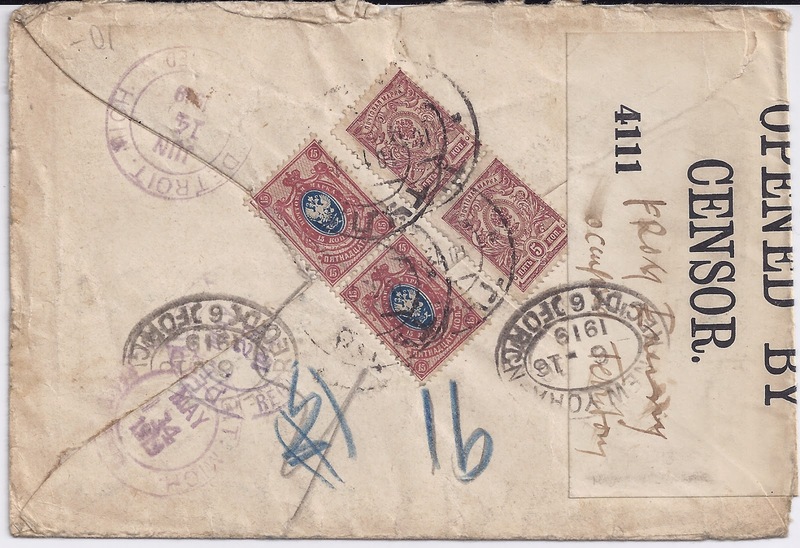 The receiver cancel of New York is over the paper seal, so it's definitely the case that the cover was censored on its journey to the USA not on its way back to Russia. The envelope arrived in New York on the 6 June 1919, six months after it was sent, and then arrived in Detroit on 14 June. But as so often with foreign mail to the USA at this time, the Post Office claims not to have been able to locate the addressee. The letter is therefore marked for "RETURN TO WRITER". But there are no Russian cancellations to indicate that it got back to where it came from. 21 August 2014 Alexander Epstein comments: The cover from Tula of December 1918 interested me. However, after some reflection, I cannot agree with your conclusions for the following reasons. I have the feeling that the problem is a wrongly adjusted canceller, i.e. the letter was posted actually in 1917 rather than 1918! First, there were no postal communications between Soviet Russia and abroad at the end of 1918. They existed, for example, with Germany until 1 December as the latest known date according to the literature. Second, the Registered (!) letter is franked on 40 k, i.e. according to the rate of 1 September 1917, while the foreign rates were raised (to 60 k for R-letters) as early as on 28 February 1918. My theory is as follows. The letter was posted soon after the Bolsheviks seized power in Petrograd and began to extend their power gradually into other regions. Consequently, the movement of mail became slower. This cover passed via Moscow where censored, then Petrograd. The only way from European Russia to the West was at that time via Finland, Sweden etc. Thus, this letter should be transferred first to Helsinki. However, power was seized there by Red Finns in the 2nd week of January 1918 and the war with the White Finns who held the northern part of country started then. Thus, the cover was delayed in Helsinki for rather a long time and could be forwarded farther only after the White’s victory. Of course, we cannot say when it happened actually. Also Germans landed in Finland in March 1918 and helped in defeating the Reds. This explains the note “from enemy territory” on the British censor’s label. Of course, my theory has some gaps too (e.g. very long time for the letter on the way to the USA) but I believe that it can explain something.